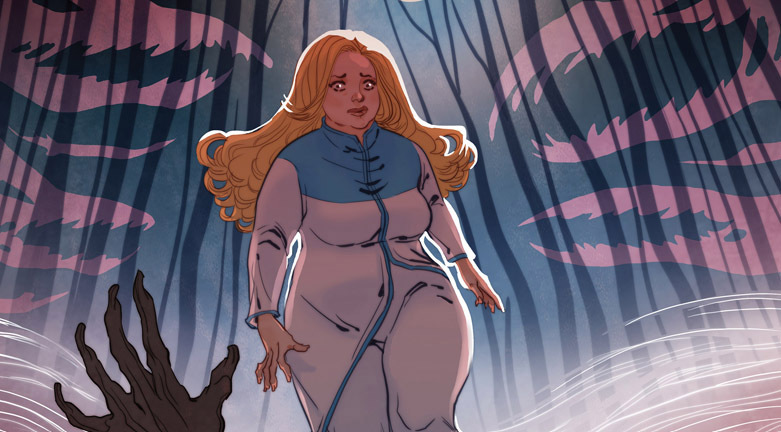 Home » Comics and Comic News » First Look: Jody Houser and MJ Kim Hunt Ghosts in FAITH: DREAMSIDE #2 – In Stores October! As first revealed at The Beat, Valiant is proud to present a first look within the pages of FAITH: DREAMSIDE #2, the second issue of the BRAND-NEW MINISERIES by writer extraordinaire Jody Houser (Stranger Things, Mother Panic) and MJ Kim (FAITH’S WINTER WONDERLAND SPECIAL #1)! On October 31st – just in time for Halloween – prepare yourself for a fright unlike any other, as Faith and Doctor Mirage team up to investigate the unknown! 1 Comment on First Look: Jody Houser and MJ Kim Hunt Ghosts in FAITH: DREAMSIDE #2 – In Stores October! Faith is “fat” but still well-proportioned. Baby steps, I guess.